Archive 2012-2013 — St Aidan's C.S. 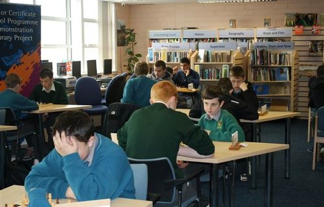 The second JCSP Chess Tournament kicked off in James St CBS Dublin in the Jamebo Library on 3rd May 2012 and featured six schools form within the thirty JCSP Library School's around the country: St Paul's CBS, North Brunswick St Dublin, James' St CBS, Terrance MacSwiney Community College, St Kevin's College and St Aidan's Community School Tallaght. St Aidan's Community first year chess team captured the title for the second time. Aoife Byrne was the overall winner on the day with Jamie Doyle in second place - a real team effort! The first year team was made up of: Aoife Byrne, Jamie Doyle, Eden Mayeye, Matthew Clarke, Karl Spellman, Conor Whyte, John Maughan and Tadgh Francis took the trophy back to Tallaght on Thursday, 3rd May 2012. The senior team were: Dean Kavanagh, Lee Scott, Glen Fitzsimmon, Jason Whelan and Peter Delaney, who played an extraordinary game and were great support on the day. 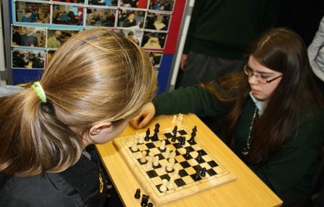 The chess team play chess for two hours a day and attend St. Aidan's chess lessons three time a week with Mr Fernandez. 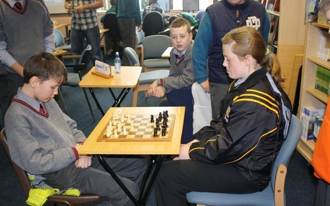 "I like chess because it forces you to think a lot and use your brain," said Aoife. Tagged with chess, successful, team. October 13, 2012 by Conor Shortall.